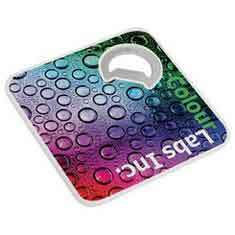 Drink coasters make ideal corporate gifts, especially if they are customised with your organisations name and contact details. 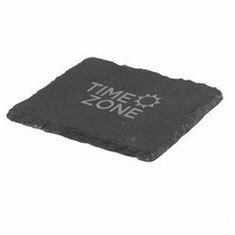 Our large range of custom coasters and personalised coasters are supplied printed or engraved with your advertising message ensuring your business remains top of mind when the product or service you supply is required. 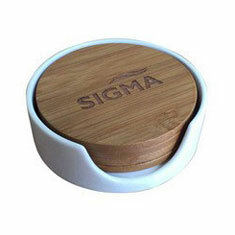 Branded coasters and printed coasters remain a popular method of promotion. Our extensive range of quality coasters includes coasters made from: eco-friendly bamboo, slate, stainless steel, vinyl and plastic. If your logo is best reproduced in full colour, then make sure you take a look at our Bottle Bud Opener-Coaster or our Vibe Coaster Set which both have the ability to be printed in full colour. 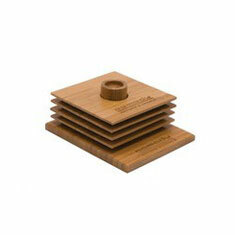 Many of our coasters are available for individual purchase or packed into sets. If you can’t find what you’re looking for on our website, please give us a call as we have hundreds more products to choose from. Call us now and let our customer service team members send you out a no obligation sample as it’s our aim to make your promotional product ordering easy. 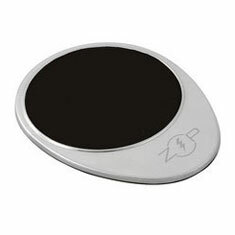 Crafted from quality brushed stainless steel, this stylish coaster features a non-slip base with super-absorbent surface. Mug additional. This upmarket 4 piece coaster set is made from leather and features stylish contrast stitching. This product can be printed in full colour for maximum impact. 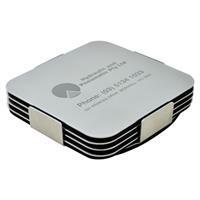 This stylish 4-piece coaster set is ideal for use in a meeting room or boardroom. 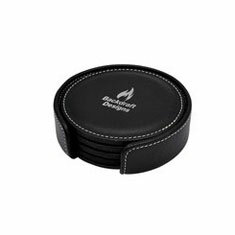 Made from stainless steel and laser engraved with your logo, each coaster features a rubberised non-slip base. 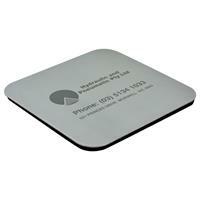 This stylish coaster, made from stainless steel and laser engraved with your logo features a rubberised non-slip base.